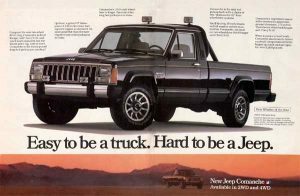 Outlined below is a brief history and review of the the Jeep Comanche nameplate. It is meant as a simple summary for the novice. For more advanced information be sure to check out our Forum page for resources on technical data and specifications. The Comanche is the nameplate for one of the rare Jeep compact “cowboy” pickups. 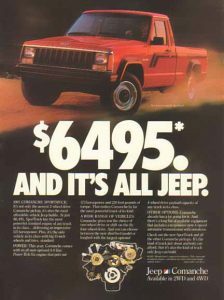 The Jeep Comanche was first produced by AMC in 1986 and then by Chrysler from 1987 to 1992. 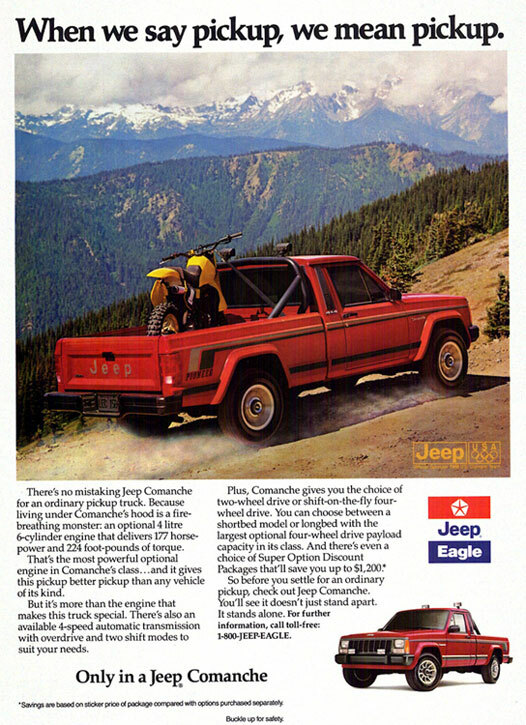 Like all other Jeep models the Comanche had a unique two character abbreviated designation. This was a practice carried over from the Jeep Willys Military days. 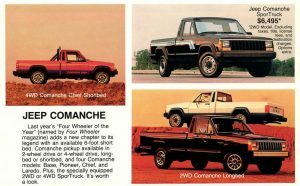 The Comanche was known as the MJ and had its body, styling, engineering and drivetrain all based on the XJ, the early Cherokee/Wagoneer models. Initially pickup trucks and jeep vehicles were very utilitarian. They were mainly used by farmers, ranchers, hunters and others that wanted bare bones amenities but capable off-road ability. As the auto market matured in the 1980s small compact pickups became more desirable for a few different growing private and public segments. This was partly due to foreign competitors such as Toyota and Nissan but also because of the continued shift from agricultural to industrial to a service based economy. Commercial contractors, professionals and tradesman such as plumbers, locksmiths and electricians began to use compact pickups in favor of better fuel economy. Pickups also became popular among regular private citizens for general purposes and recreational use. 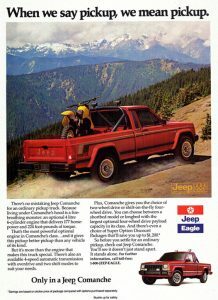 This was particularly the case with the Jeep Comanche because of it carrying the off-road proven and capable Jeep name. From the start enthusiasts were modifying Comanche trucks for more extreme off-road capability. Although the Comanche was based on the XJ it was more of a conventional truck design. This included a removable cargo box and body-frame design. Although the VW Rabbit Pickup and Dodge Rampage were actually classified as “coupe utilities” because the cargo bed was not removable they would be considered the closest competitors at the time. The Comanche was available in both 2WD and 4WD with a 7 foot long bed and shorter 6 foot cargo bed introduced in 1987. One of the key difference between the Comanche and comparable pickups was that it featured a tough “Uniframe” design with rails that were over eight inches deep. Cosmetically the Comanche shifted from a ten slot grille (Cherokee) to the iconic eight (CJ) slot in 1988. 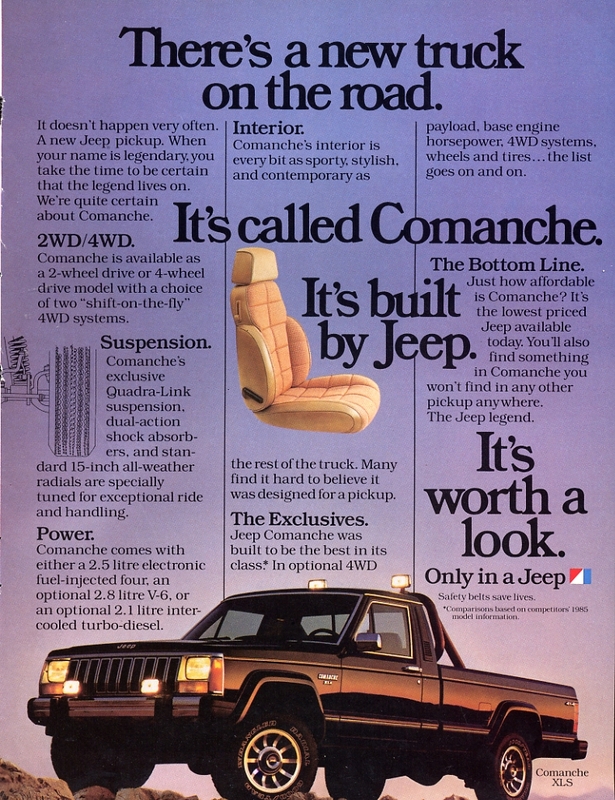 Suspension on the Comanche was unique for the time to Jeep. It featured front coil springs with upper and lower control arms called the “Quadra-Link” suspension. The idea was to provide much greater axle articulating for off-roading on rugged uneven terrain. A track (sway) bar was also used to keep the axle centered. This revolutionary front suspension design would be replicated and used on the Grand Cherokee, Dodge Ram as well as the TJ and beyond Wranglers. Rear suspension would feature more standard leaf springs but longer than the Cherokee to provide for better hauling capacity. The standard rear axle was a Dana 35. A larger Big Ton package was also available with larger leafs, wheels, tires and a Dana 44 rear axle. This increased payload from 1,400 lbs to 2,205 pounds which was superior to all other compact pickups of the time. 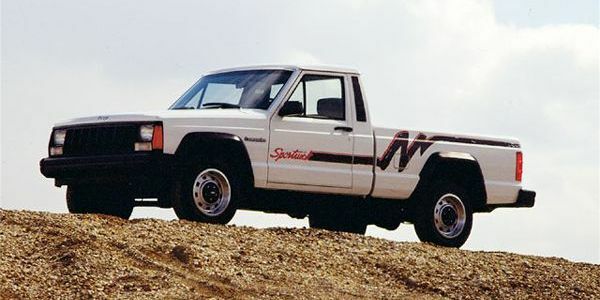 The cult classic Jeep Comanche was only produced for seven model years but was around long enough to leave an imprint on the enthusiast community. Unlike other similar vehicles of the era, the Comanche is still sought after by 4wd enthusiasts and Jeep lovers. Because of the effort for Chrysler to fit the Jeep brand within its other core offerings, the Dodge Dakota was actually the successor to the Comanche. Chrysler would not create another Jeep pickup and instead decided to focus on SUVs and off-road utilities for the Jeep brand, while utilizing the Dodge Marque for pickup trucks. Anything we missed? Have anything to add? Let us know in the comments below.